David Swanson's new book, War is a Lie, is out today and there is a campaign to bump it up the Amazon sales lists to #1.Why not support a worthy author and the common wealth by buying a copy for your local library? You can read all about it at www.warisalie.org. 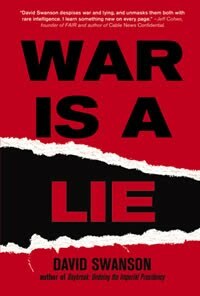 From the website: War is a Lie is a thorough refutation of every major argument used to justify wars, drawing on evidence from numerous past wars, with a focus on those wars that have been most widely defended as just and good. This is a handbook of sorts, a manual to be used in debunking future lies before future wars have a chance to begin. “David Swanson despises war and lying, and unmasks them both with rare intelligence. I learn something new on every page.” — Jeff Cohen, founder of FAIR and author of Cable News Confidential.